The climbing rose Moonlight was first bred in Germany in 1995 by Tim Hermann Kordes. It took 9 years before Kordes brought this rose to market in Germany, and it wasn’t introduced in the United States until several years later in 2008 when Wayside Gardens was finally able to offer it commercially. 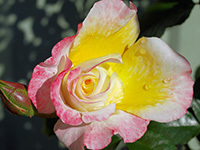 The parentage of this rose is not fully known however this rose is quite unique for its many changing colors. 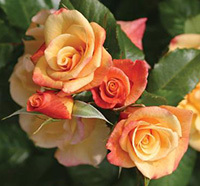 Kordes Moonlight roses start off with orange or apricot buds when the blooms first form. These will fade to a nice rich yellow when the blooms open. 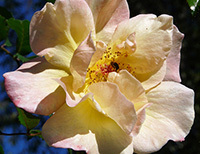 As the blooms continue to age and open up, the edges of the petals will often form with a soft pink color. The blooms on the climbing rose Moonlight will average just under 3 inches in diameter and will be moderately full with anywhere up to 25 petals each. These blooms are often sought after for cut flower arrangements because they have a strong fragrance of a fruity spice nature. This rose will reach heights of about 8 feet tall and a horizontal width of 3 to 4 feet. Growing the climbing rose Moonlight is pretty straight forward and this is actually a pretty hardy rose which should be welcome news for newer rose growers who don’t want a high maintenance rose. This climbing rose is a very vigorous grower and has a strong natural resistance to certain diseases such as blackspot and mildew, which are very common among roses. You can further add to the plant’s resistance to these diseases by keeping the leaves of the rose bush dry and planting it in a location where it will receive exposure to the natural air currents in your garden. Kordes Moonlight roses are also repeat bloomers, which means you should give them access to an ample amount of sun light. A good rule of thumb for these types of roses is to give them no less than 6 to 8 hours each day of direct sun light. If you are able to give them more than all the better. The climbing rose Moonlight is not very tolerant of shady locations and you will find that its performance will be somewhat lackluster if you try and force it into a shady spot. Planting the climbing rose Moonlight is not at all difficult and anyone with a few basic hand tools should be able to get the job done. I always suggest to growers that they take a trip to the local nursery or garden center, before they start digging, and pick up a bag of a good organic compost. When you dig your hole, mix the compost in with the loose soil at a ratio of 1 part compost for every 2 parts soil. You will be amazed at how well your roses establish themselves in this stuff! How you go about planting your Kordes Moonlight roses depends a bit on where you purchased them from. For instance, if you bought your roses locally, chances are they were already established in containers and ready to bloom. These are the easiest to plant because the guesswork has already been done for you. Dig yourself a hole that is about twice the diameter of the container, and equally as deep. This will keep the bud union at the same depth it was originally planted at, while giving you plenty of room around the roots of your climbing rose Moonlight, for your new soil mix. If you bought your climbing rose Moonlight from an online retailer, then it may have been shipped to you as a bareroot plant. These may look intimidating, but they are not overly difficult to plant either. You should first soak the plant overnight in a bucket of lukewarm water, prior to planting day. Then dig yourself a hole that is as wide as the longest roots on the plant, and deep enough to allow you to set the plant atop a mound of soil, and still keep the bud union an inch or two below the surface. Once you set your climbing rose Moonlight in place, spread the roots out in all directions and then back fill the hole only halfway to start. Water the loose soil heavily until it flows around the roots like mud, then back fill the hole the rest of the way. Give the soil one more heavy watering and top off any final settling that may have occurred. You should also mound up some mulch around the exposed canes to help prevent them from drying out, until new growth has formed. You can then remove the mound back to ground level. Taking care of the climbing rose Moonlight is pretty straight forward and you can follow basic rose bush care guidelines. You will need to make sure that your roses get ample water, but also that they are not staying wet for long periods of time. If you have to water them manually, take care not to water the leaves excessively as this can lead to risk of certain diseases and pests. You can give your Kordes Moonlight roses a dose of an all-purpose granular fertilizer in early spring when the leaves begin to bud. Since this is a repeat bloomer it will benefit from additional feedings throughout the growing season. I will typically give my roses a second feeding just before the first big bloom, and then a third feeding around the middle of summer to encourage additional flushes. You should prune your climbing rose Moonlight in the early spring before the leaves start to form. Begin by removing all the dead wood as well as any discolored canes. Next, prune back any overlapping lateral canes so they do not compete with one another for sun light, once the leaves open. 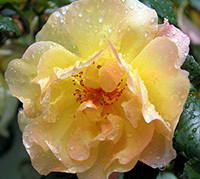 Lastly, give your climbing rose a light pruning for shape if you desire. This is also the time to rake up around the base of your climbing rose Moonlight, to clean up all the dead leaves and debris that has collected there. Throw away all this material in the trash, along with your cuttings. Never let decaying matter lay around the base of your roses as it can become a breeding ground for certain pests and diseases. I will always finish up my pruning by giving my roses a fresh lay of mulch to start off the growing season.